Ana Marcela Cunha of Brazil was photographed in her yellow Brazilian swim cap typically slow to start in the 5 km race at the 2017 FINA World Championships in Lake Balaton. 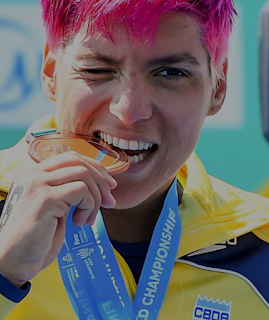 But the two-time personable Olympian is always fast to finish as she and teammate Poliana Okimoto are entirely have been part of Brazil’s total 13 open water medals at all the FINA World Championship events. Cunha has 4 bronze medals (5 km + 10 km Hungary in 2017 + 10 km Kazan in 2015 + 5 km Barcelona in 2013), 2 silver medals (10 km Barcelona in 2013 + 5 km team pursuit Kazan in 2015), 2 gold medals (25 km in Shanghai in 2011 + Kazan in 2015) for 8 World Championship medals.